The ERSA DIGITAL 2000 A is an intelligent, microprocessor controlled soldering station. Outstanding flexibility and multi-functionality sets this system apart from others. The ERSA DIGITAL 2000 A is fully antistatic according to MIL-SPEC/ESA standards and has a potential equalization jack with a high-resistance connection to the soldering or desoldering tip. The following tools can be operated with this station: soldering irons Tech tool, Micro tool, Power tool, Pincette 40 desoldering tweezers and X-Tool desoldering iron. The soldering station automatically identifies the tools when they are connected and adjusts automatically according to the tool's requirements. Apart from multi-functionality, simple and comfortable operation is another highlight of the station.Further features are: set value adjust-ment, the possibility to select °C or °F on the temperature unit, selection of a stand-by period between 0 - 60 minutes, offset and calibrating function, as well as the possibility to block any adjustments by a 3-digit pass word. The station's heating system can be adjusted to the corresponding application with the help of the integrated "Energy Function". 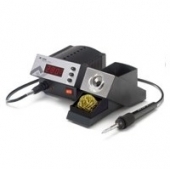 To increase user-friendliness, the soldering station also includes 4 programs. Each program can be configurated independently and differently with the above mentioned functions. Each soldering iron has its own program, and when the tools are changed, the soldering station automatically switches to the corresponding program. Consequently, the DIGITAL 2000 A is perfectly suited for operation with the Tool Selector. If only one soldering iron is required, all programs are available for this iron.The temperature is controlled by a digital PID algorithm, optimized for precise and quick temperature control. SMD desoldering tweezers ERSA Chip tool for rapid and safe removal of all SMDs. The desoldering tip range of the Pincette 40 covers everything from MELFs and MINI-MELFs to SOIC packages, QFPs and PLCCs. The soldering station 0DIG20A43 consists of electronic station 0DIG203A, desoldering tweezers ERSA Pincette 40 with long-life tip 0422ED and tool holder 0A30.